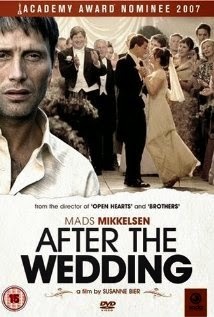 My first awareness of Mads was with "After The Wedding" which is still one of my very favorite movies. He plays an idealist working in India at an orphanage coming back to Denmark to negotiate with a Danish philanthropist, but After the Wedding his life changes. It really is a wonderful movie which I don't want to spoil. Directed by Susanne Bier it had been nominated for best foreign film Oscar. "Flame and Citron" released in 2008 about the Danish resistance in WWII with lots of uncertainty. Won a few awards and nominated for others. Pusher II shocked me--I was used to a likable, thoughtful man, but his role here is selfish, short sighted and definitely not likable. A truly good actor disrupts your preconceptions. "Adam's Apples" is a sort of black comedy Mads played a minister who always saw good even in grotesque bad things. He was incredibly naive and lots of people took advantage of him. Being a James Bond villain is a badge of honour. He played Le Chifre in "Casino Royale" as sinister and cruel as one could hope for. "A Royal Affair" was nominated for an Oscar. Again Mads plays a sympathetic, even noble character. this time he is a physician brought to he Danish court. At one point he suggests a smallpox vaccine. I checked this in Wikipedia and it turns out to be true. 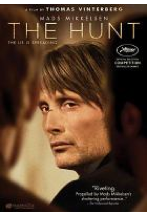 "The Hunt" nominated for Oscar is a wonderful movie depicting people at their worst. Based on a young girl's claim which she later recanted people assumed the worst. The ending was a bit brutal, but the alternative ending was even more brutal. I enjoy his films in English or Danish, but he has led me to other Danish films that I have found enjoyable. Susanne Bier directed movies not only in Denmark winning another Oscar best foreign film for "In a Better World" and another, "Brothers" later remade in Hollywood. Susanne herself has directed Hollywood movies. Now that he is getting really good reviews on the popular "Hannibal" tv series as Dr Hannibal Lector he will get more respect. Anupam Kher epitomizes for me the worst and the best of Bollywood. I am of two minds on Anupam. In some films I have been embarrassed thinking his acting reminded me too much of Jerry Lewis at his worst. I had seen enough of Bollywood to find lots of things to like, but could also see why my North American acquaintances tend to cringe when they think of it. As an excuse, I can appreciate that to get ahead in a career you do whatever is required--Steve Martin was pretty wild when he hit my attention, but has proved to be pretty good at serious drama, enjoyable comedy and has done some serious writing. Bollywood has always tried to cater to families (from Grandmother to the kids) and comic relief is important. On the other hand Anupam has demonstrated his versatility. We movie goers tend to judge the actors by what we see on the screen. He has managed to take part in a lot of critically acclaimed films as well as some very popular ones. Obviously he fits in well with film crews and has proven to be very flexible. He has worked with a lot of well known directors, producers and other actors in at least five countries. He is popular as a father figure, but that description covers in his case a wide range of styles. Over 350 films. Not usually a leading character, but he still must have juggled a lot to fit it all in He is busier than ever and seems to like it. He has also acted as an ambassador for Bollywood and been involved with acting schools. Anupam started making films in 1982. His first English speaking movie in 1984 was "Kim" starring Peter O'Toole, but Anupam was uncredited. He has appeared in some of my very favorite movies such as "Kuch Kuch Hota Ha"i as Rani Mukerji's father (and Shah Rukh Khan's father in law), but in this one I feel he overdid the comic relief. On the other hand he played a deft hand in comedy and drama as Shah Rukh Khan's father in the trend setting classic, "Diwali Dulhania le Jayenge" where he won an award for comedy. In "Darr," a scary movie he played comic relief excessively--but perhaps this movie really required comic relief. In any case he won best supporting actor in a comic role from Filmfare. Playing the father role in a very professional manner is more normal. In "Wake up Sid" as father to Ranbir Kapoor he played a tough, but loving father in an excellent coming of age movie. In "Vivah" he played a father encouraging his son, Shahid Kapoor to get married and was supportive of the prospective bride's family (in some ways from a relatively lower class). In "Dil Bole Hadippa" he was a cricket loving father again to Shahid. In "Badma$h Company" again played father to Shahid , but as a tough ethical business man disappointed in his son. In "Pyar Impossible" wearing a wig he played an empathetic father to producer director Uday Chopra in a movie not highly rated, but enjoyable to watch. In "A Wednesday" he played the Mumbai city police commissioner threatened by bombs from Nasseruddin Shah. A lot of tension in this movie which won a number of awards. In "Breakaway" Anupam came to Toronto and played the father to Vinay Virmani who wrote the script. Hockey was the key ingredient linking Sikhs and Canada's national game. Russell Peters gave it some more Canadian flavour. Anupam had played a cricket playing father in "Bend it Like Beckham." In "Silver Lining Playbook" he played a psychiatrist and with the rest of the cast had been nominated for awards as part of an ensemble cast. In "Veer-Zaara," he played a tough ruthless Pakistani lawyer, In "Paheli," another favorite movie he was a greedy merchant. "Rang De Basanti" was another classic movie starring Aamir Khan. 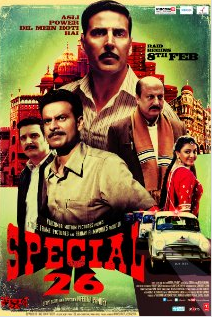 "Special 26" can compare itself to "Oceans Eleven" favorably. Akshay Kumar led the cast, but Anupam played a very clever con man with a large brood of children. He was excellent. "Jab Tak Hai Jaan" was the last film for director Yash Chopra's and was noted for Shah Rukh Khan's first screen kiss. 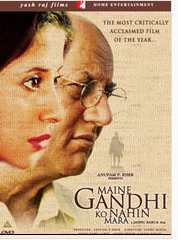 Anupam played the father of Katrina Kaif. "Maine Gandhi ko Nahin Mara" pictured at the top with Urmila Matondkar was the movie that inspired this blog post. Anupam was a producer and really gave a top notch performance in the difficult role of a man with Alzheimer's. He paid his dues and will be remembered for this role and dozens of others. He added value to a number of worthy movies. When I now see his name I know there must be something good to look forward to. Doors Open is a provincial program and I suspect other cities around the world have some sort of equivalent. It is a great opportunity to know your city a little better. I have been attending the local Doors Open since 2010 and always look forward to it. For those interested in Hamilton, Ontario here is a recap of some of my experiences with Doors Open. There probably are thousands of other versions. This building used to house the Hamilton Times. It is now combined with an adjacent building and is called the Empire Times. A good area for restaurants. One unique feature is the glass elevator visible from the outside. Built around 1890. This building used to be a factory, at one time for Westinghouse. It has now been re designed as the McMaster Innovation Park and this is the atrium. By definition it encourages innovation. I was also surprised to learn they devote a lot of wall space to local artists. Sylvia Simpson is a well known local artist working on a project during Doors Open. Along with other artists she submits art to be hung on the wall on a quarterly basis, but you can also see some of her work on a longer term basis. The Staircase Theatre was originally built in 1914 as a transformer sub station for the Cataract Power Company. It has now become a cultural hub including a small theatre, a cafe and rooms for meetings and performances. The Dundurn parking lot was full so I continued up to the Hamilton Cemetery where I had a very interesting tour. Robin McKee is a regular guide who gave what he called a highlights tour. I had not realized that this site was very critical during the War of 1812. It was from here that the famous Battle of Stoney Creek was planned and executed by the British based here. The American invaders outnumbered the Brits approximately 5 to 1, but decisions made here helped stem the tide. Many famous people were buried here and I chose the memorial site for George Hamilton, to show, the one whose name was given to my home city. Robin explained the ball at the top was by a mason honouring another mason. To be a mason it was necessary to take a square block of granite and reduce it to a perfect circle. Other bits of history included links to the War of 1812, a cholera epidemic, a rail disaster, the American Civil War and a few wealthy citizens. Robin was able to make it very interesting. Pictured is the Sanford mausoleum. The Lister Block was built after the original 1886 building burnt down and was replaced in 1923 as a major building housing shops and offices. It had become an eyesore for years while controversy swirled around what to do about it. Some wanted to tear it down, others wanted to restore it, but different versions cost widely different amounts of money. Eventually it was restored and during Doors Open it was accessible to the public. It now is something to be proud of. Pictured here is a hallway. The Auchmar Estate was falling apart, but some citizens wanted to restore it. They opened it up for t 2012 Doors Open. It was an impressive building that also had a separate chapel. Built between 1852-1854 by Isaac Buchanan who had helped form both the Toronto Board of Trade and the Hamilton Board of Trade. He had also been a Parliamentarian (before Confederation) representing a Toronto riding and later for a Hamilton riding. During World War II it had been used as a convalescence centre. Whitehern is just behind City Hall. It dates back to 1850. It was the home of the McQuesten family. They had helped to re locate McMaster University from Toronto to Hamilton. They had produced a Minister of Transport. Once they entertained British royalty. Ferguson Pumping station actually services my home. But it has a long history. Like many new communities Hamilton suffered from cholera and the citizens realized it required better water. Treble hall dates back to 1879 and was originally built for retail shops, offices and a meeting hall.When I visited the bulk of the building was under restoration, but they had uncovered all sorts of treasures. One pointed out to me was some unique ceiling tile that had come from a plant in Oshawa near where I was raised. There was also a cafe on the ground floor. There are many other buildings I visited such as Dundurn Castle, the Art Gallery of Hamilton. Most of us live in cities with a history we are unaware of. Take a little time to check it out. You will be fascinated and a little more proud of where you live.